Unnatural posturing like this makes the wall climbing sequences in the old Batman show look realistic. The graphical problems aren't merely limited to the detail or lack thereof. The game features a number of very poor graphical effects with the most fundamental being the water. You think that CRI would have made sure the water looked credible before bothering with the rest of the game, but then you'd think wrong. The water looks absolutely dreadful in some places, whilst quite passable in others. The Amazon courses look the worst, with the water appearing simply as a large brown piece of moving jelly -- nothing like the beautiful bouncy waves found in Nintendo's masterpiece or in other Dreamcast titles like Hydro Thunder. The transparency of the water in the Manhattan levels saves the appearance here somewhat, but the fact that the same drab texture is repeated over every wave, without any attempt to add some shiny effects or splashing makes it still appear ugly and drab. In some levels the water even actually flows up hills! Whoever was in charge of creating the water physics engine obviously hasn't paid proper attention to the way water behaves in the real world! These shortcomings would perhaps be forgivable if the gameplay was spot-on, but this isn't the case either. The game has a big problem with the water, your characters reaction to which seems random at best. Getting speed up across the levels where the water is choppier is simply pot-luck, something the computer AI manage a lot of the time. In the later levels winning races comes down to persistence in managing to find the random best route through the level, rather than the steering skills it should. The game's main problem though, as mentioned previously, is the lack of excitement which could so easily have been increased with faster game speed. Even with the later characters, the game's speed is just too slow to be exciting edge-of-your seat racing action (which obviously is what CRI were attempting to create, but failed miserably). Where did all the water go? It's hiding underneath that flat muddy looking road. The trick and hazards options are wasted opportunities also. Whilst there are many different tricks to try and stunts to successfully complete, in the end the frustrating gameplay removes any kind of fun these events could have. Crazy Taxi's Crazy Box is the way this kind of option should be properly implementing, where the rewards for completing a challenge are simply a great personal satisfaction of skill demonstration. The events on offer in Surf Rocket Racers either require luck in the water physics or are simply too frustrating to be enjoyable. The game's two-player option, whilst solid enough, suffers a lot from the game's shortcomings. As the game fails to excite, two-player races can be very boring, especially due to a lack of AI controlled players also on the course. The main enjoyment in the two-player races can come through trying to one-up the other player on performing outrageous tricks, something the game developer's probably never thought of hence the lack of a dedicated option for this. 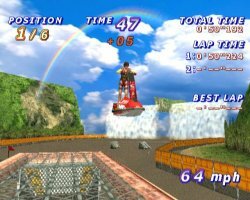 The aforementioned mid-race tricks, whilst looking nifty, are a waste of time in the single player as they simply slow you down when you're trying to place as high as possible. Finally, the game has bad VMU implementation. Whilst the save only takes up eight blocks, it can only be saved to VMU slot 1. With older titles this was passable, but now we're reaching third generation Dreamcast software its unforgivable. The developers should properly implement the ability for us to manage our VMU saves across multiple VMUs easily and quickly without having to swap the VMUs around for every other game. Overall it seems the game's attempts at arcade racing are very flawed, through poor level design which completely misses the scope for amazing "in your face" arcade levels, poor unrewarding game physics and also through badly implemented extra modes. 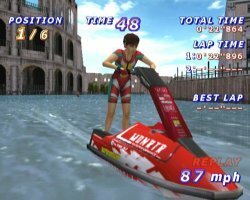 Looking at Nintendo's Waverace64, or even Sega's Model 2 arcade offering Wave Runner, shows how an arcade jet-ski racer should properly be created - no holds barred. Overall a bitterly disappointing game. Highs: Nice difficulty curve, consistent framerate, and two-player racing. Lows: Poor Water effects, drab colours, poor game design, and horrible sound.